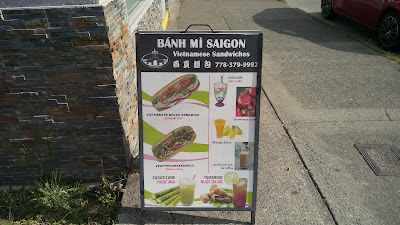 Banh Mi Saigon 西貢麵包, a place with pretty decent rating on Zomato, is never really my go-to place when I crave for a Vietnamese sandwich. 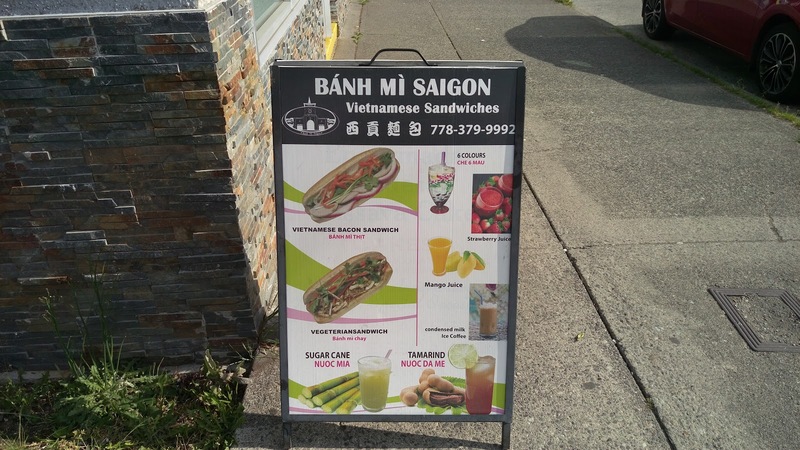 My personal preference is either the Vietnamese subs from Tung Hing Bakery 同慶餅家 on Kingsway or from Chong Lee Market 昌利市場 on East 22nd Avenue at Rupert Street. 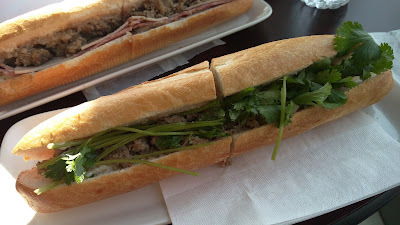 However, that being said, there's one thing that this banh-mi joint had me on the hook since day one...its Pâté Chaud. Also known as bánh patê sô, these delicate Vietnamese pies had flaky layers of puff pastry and loose ground pork filling with just the right amount of salt and pepper savoriness. 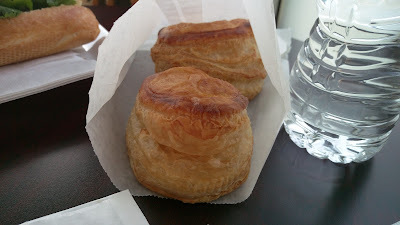 I quickly gobbled down two pies before my sandwich arrived. 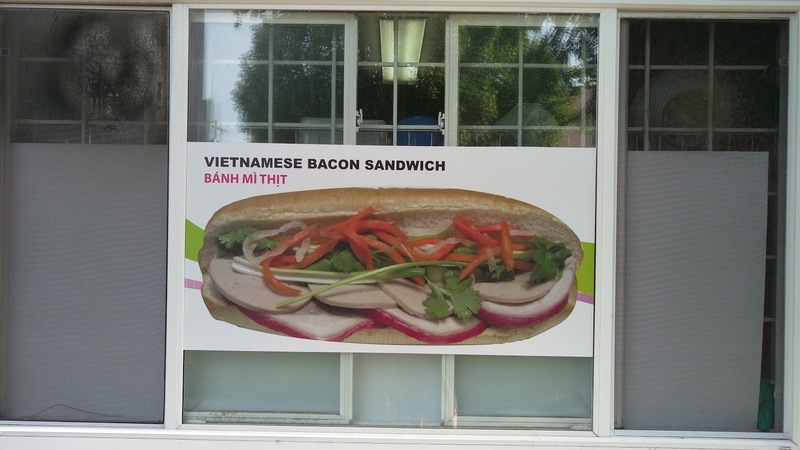 Because of my temporary diet restrictions, I have eliminated all the raw and pickled vegetables in my Bánh Mì Đặc Biệt, the "special" sub. This special combo sandwich was filled with pork pate and various cold cuts of pork. 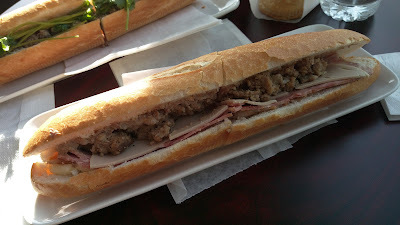 The overly crusty buttered baguette was a bit dry and dense. 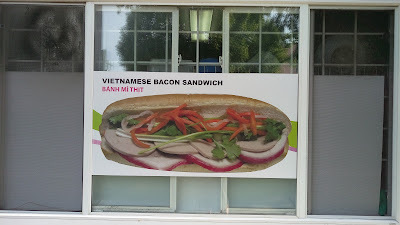 Buddha Boy had a Bánh Mì Xíu Mại, the "meatball" sub. Using the reason that I might want to take a bite of his sandwich, Buddha Boy requested to eliminate all the vegetables except for cilantro. Sure hun...nice excuse. The restaurant has a twelve-hour operation from 7am to 7pm daily, and this works for a lot of early risers. While it's not the top on my list, this neighborhood joint has slowly climbed up Buddha Boy's list, especially when he wanted something quick before work.